For the month of February, we are pleased to showcase the works of abstract artist, Ron Brunelle in the Inside-Out Gallery. 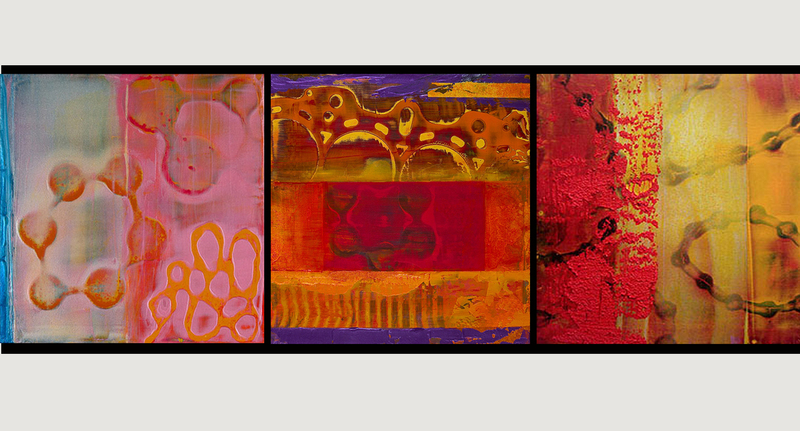 Ron Brunelle is a Somerville-based contemporary artist, creating abstract, non-objective acrylic and mixed media paintings as well as monotype printmaking. His compelling use of space and dynamic approach to painting draws the viewer in. Brunelle’s broad use of vivid color, textured surfaces, multi-layered paint, translucent washes and a variety of approaches create powerful works, refined in rich color sensibility amidst a balance of intent and the element of chance. “A common thread throughout the show is my love of color. I often will build up many layers in a painting, obliterating early layers of paint with new ones, [and] then, scraping or sanding to expose portions beneath,” said Brunelle. Brunelle was a recipient of a Somerville Arts Council 2011 Visual Arts Fellowship Grant in Painting. He studied at the School of the Museum of Fine Arts in Boston, and he has exhibited widely in the Boston area, including galleries such as Bromfield Gallery, 13 Forest Gallery, Nave Gallery and Tufts University Art Gallery.